A fantastic gift for any new mom and her little baby! Beautiful handmade four tiers Diaper Cake is perfect for a Twins/Jungle themed baby shower! It can be used as a shower centerpiece or just to give as a gift. Two in a Jungle! 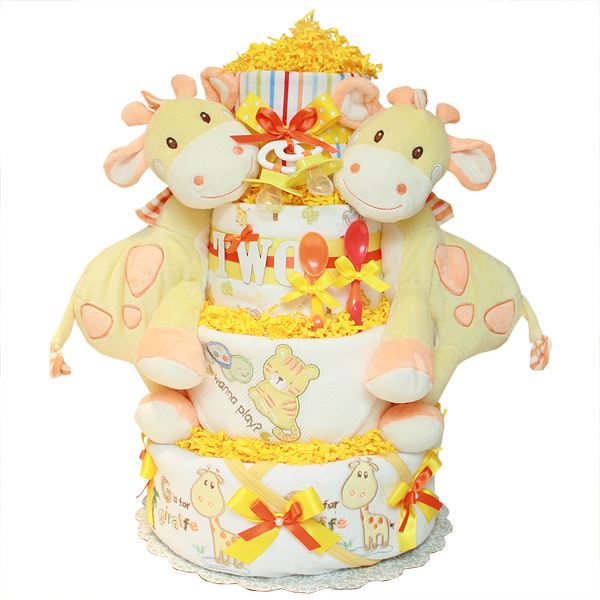 Diaper Cake is made of 60-70 Huggies Snug & Dry diapers size 1 (8-14 lbs. ); two flannel receiving blankets 100% Cotton; two hooded towels with a giraffe; one waffle blanket; four washcloths; two pacifiers; two rattle toys; two plush giraffe toys; two baby spoons; ribbons and bows.